The Guam-based “Island Knights” of Helicopter Sea Combat Squadron (HSC) 25 provided aerial firefighting for southern Guam, along the northeastern edge of the Naval Magazine, when a brush fire quickly began to spread and threaten local homes of Santa Rita. Read all about it here. 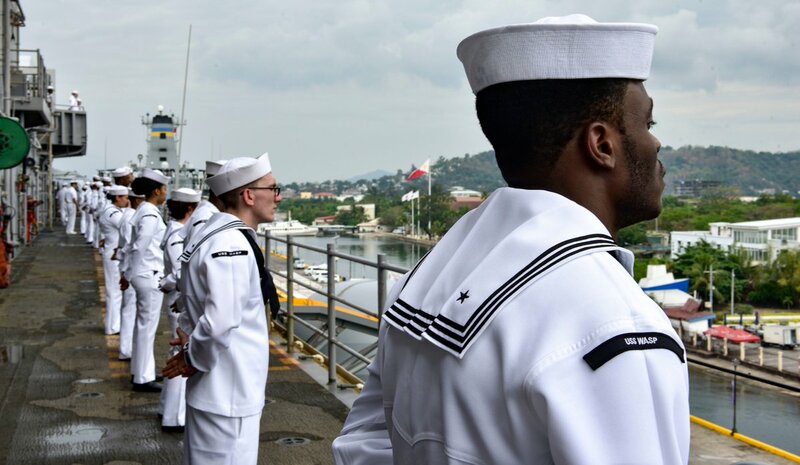 Seventh Fleet Flagship USS Blue Ridge arrived in Hong Kong for its first visit to the port in more than three years April 20. Find out what they have planned here. “The moment I made it on deck my primary focus was the care and safety of the mariner,” said Hospital Corpsman 2nd Class Richard Derrick. Read all about it here. Helicopter Sea Combat Squadron (HSC) 25 conducted deck landing qualifications with Royal Australian Navy guided-missile frigate HMAS Melbourne (FFG 05) April 16. Find out why here. The Federal Asian Pacific American Council (FAPAC) will recognize a Naval Beach Unit (NBU) 7 Sailor at its national conference in Huntsville, Alabama, May 16. Read more here. RADM Brad Cooper, commander of Amphibious Force SEVENTH Fleet, sat down with James Bolinger from Stars and Stripes recently to talk #NavyReadiness. Read more below. Congratulations to outgoing Captain Colby Howard and incoming Captain Chris Herr who changed command of USS WASP LHD 1 in a ceremony Saturday. Fair winds and following seas Captain!